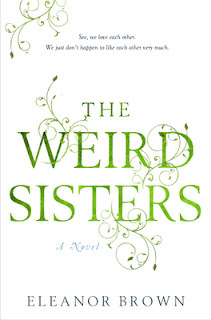 "Three sisters have returned to their childhood home, reuniting the eccentric Andreas family. Here, books are a passion (there is no problem a library card can't solve) and TV is something other people watch. Their father-a professor of Shakespeare who speaks almost exclusively in verse-named them after the Bard's heroines. It's a lot to live up to. The sisters have a hard time communicating with their parents and their lovers, but especially with one another. What can the shy homebody eldest sister, the fast-living middle child, and the bohemian youngest sibling have in common? Only that none has found life to be what was expected; and now, faced with their parents' frailty and their own personal disappointments, not even a book can solve what ails them..."
I think it sounds interesting, and a little different from what I would normally read. Though the description doesn't really grab me as much as the cover does, I have to think that the title gives you an idea that the writing would be interesting. What do you think? What have you discovered lately? This was an interesting book. I got it on Audible last year and listened to it, and I did actually enjoy it. It's nice to take a break from all of the paranormal stuff I usually read and just read about someone's life written really beautifully. I really like the title and the cover, for some reason. It sounds very intriguing--love forcing myself out of my reading comfort zone. This is a wonderful debut novel and I look forward to reading more from Brown. If you love a sister story, Shakespeare or reading in general, this will be a perfect read for you. HIGHLY recommended.